New Era for Oil Prices ?!? Thread: New Era for Oil Prices ?!? 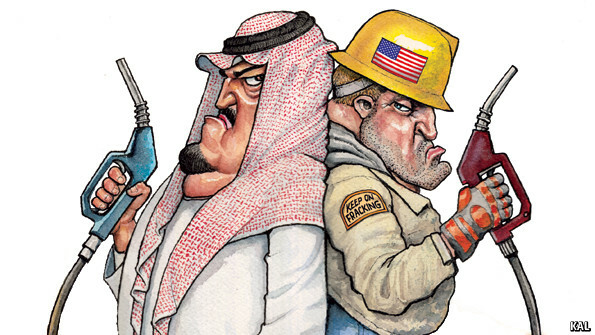 Difficult to know whether it is the Saudi’s and US are in cahoots to fcuk Russia and Iran, or whether the Saudi’s really are trying to put lots of Shale companies out of business ?!? From what you read it seems like the US are advancing technology all the time to drive down the figure they need to make it profitable so they might be able to tough it out ?! ?….but regardless is good news that OPEC are finally starting to lose their market share! Last edited by davis121; 28th November 2014 at 21:24. Where were all these so-called 'experts' in the summer when oil was trading at $115? Don't think I read anywhere of any new era imminent. Suddenly it's all I read about, in all analysis, everywhere! More I think really know one knows what the hell going on, despite how strong their conviction. But havent the US only very recently overtaken the Saudis as the biggest oil producer ? Added to that the Ruski's hands are tied as their wells will freeze if they cut output.....so will be interesting to see how it pans out! Petter, mjwx, kris-one and 6 others like this. Malaysia Government has been subsidising petrol for years. Starting December 1st, no more, the petrol price will be based on market price. Currently for RON 95 its MYR 2.30. Not sure how much it will be on Monday. Or you would start to think perhaps the info flow is just manipulated..
And yes, this oil ruble connection runs deep.. Geo-games a foot there I suspect..
Chinas slowdown (which could spiral depending on if they hit the monetary gas again) seems quite real to me, and of course is a driver.. But then I think everyone knows peak oil is real, but thats a longer out there issue than next year..
“What we have now is a year long game of chicken,” he said. “The Saudis are waiting to see how much U.S. production adjusts because of prices and they are waiting to see how much pain the other major oil producers can take before they are willing to make meaningful cuts.” Referring to the global oil benchmark, he added, “If Brent sinks below $60, I think you will see OPEC hit the panic button pretty fast.” That would mean an extraordinary OPEC meeting, and emergency cuts in production. Also weak against the USD. Going on holiday in a week, going to be expensive. The currency slid almost 9% against the dollar before rallying after suspected central bank intervention. Don’t get used to cheap oil forever, Pursell said. There might be a supply glut now, but when global growth increases, it will sponge up the excess. “The only scenario where the US can’t grow and oil stays at these levels is if global demand is in tatters for the next two to three years. And we don’t believe that will happen,” he said. Adam Longson, analyst at Morgan Stanley, agreed the lack of investment could push prices much higher in 2017 and 2018. Some international projects that were supposed to be developed are expensive and may be mothballed, meaning that when demand rises, supply might not be able to keep up. That could cause prices to rise sharply. Consumers get whiplash from big swings in oil prices, he said. That ultimately hurts demand as it gives buyers reasons to “wean [themselves] off oil”, he added. Unlike in the past, there the potential for users to go to alternative energies is greater. “The potential for substitution at higher oil prices is quite substantial, and permanent once in place,” he said. So the economics of oil have changed. The market will still be subject to political shocks: war in the Middle East or the overdue implosion of Vladimir Putin’s kleptocracy would send the price soaring. But, absent such an event, the oil price should be less vulnerable to shocks or manipulation. Even if the 3m extra b/d that the United States now pumps out is a tiny fraction of the 90m the world consumes, America’s shale is a genuine rival to Saudi Arabia as the world’s marginal producer. That should reduce the volatility not just of the oil price but also of the world economy. Oil and finance have proved themselves the only two industries able to tip the world into recession. At least one of them should in future be a bit more stable. Waharoa and slampay like this. Does seem to be a game of which country will go bust first....which could well be Venezuela before Iran or Russia ?!? Anyone else notice.. When oil went up, air tickets ran up in lockstep.. Now oil has come way back down.. Air tickets have refused to budge. They will argue they hedge their oil exposure a long way in advance. Maybe take a while to filter through. Thankfully seems be doing that in the forecourts in UK. Down to 113p in some places. Any drop in oil will also be offset by the dollar strength too. Yet it seemed pretty instant on the way up no ?? So Ruski's now upped interest rates from 9.5 - 10.5% on thursday and yesterday now up to 17%!!! so nearly doubled the already high interest rate in a week! Last edited by davis121; 16th December 2014 at 07:52.